Between 1987 and 1989, while working as a Peace Corps Volunteer, the author lived without electricity or running water in a bamboo hut by the side of a river in Southern Leyte, Philippines. 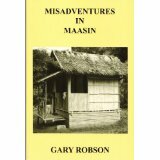 Misadventures in Maasin tells the humorous story of this young and inexperienced American in his first cross-cultural encounter. Singing coworkers, flying cats, traipsing rats, perplexing bats . . . it's all here.